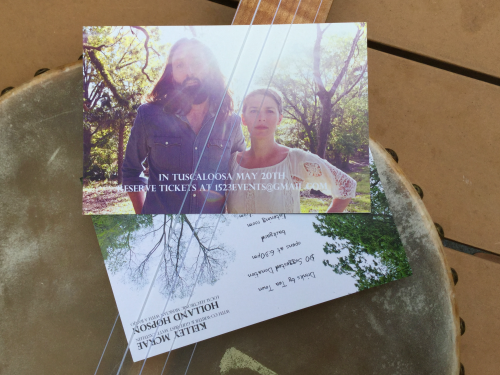 I’ve traveled long distances for gigs before, but Friday I’ll just walk around the corner and down the street for a backyard concert featuring Kelley McRae and Matt Castelein. (Weather permitting; In the event of rain we’ll be inside.) Kelley and Matt are wrapping up an album release tour for The Wayside. I’ll be opening with a song-oriented set of banjo and electronics pieces including at least one new tune. Hope to see you in the ‘hood! This entry was posted in Music, Photo and tagged Banjo, Electronics, Holland Hopson, Kelley McRae, Matt Castelein, The Wayside, Tuscaloosa, weather by Holland Hopson. Bookmark the permalink.